I’ve decided that my monthly book club meetings (and corresponding dinners) are so incredible that it’s time to start blogging them up. My Get Lit book club has been gathering for nearly a decade, and our monthly meetings always fill my tank. Last year we were too careless with our title selections. Our rambunctious, festive meetings became so much fun that selecting the next title turned into an 11th hour afterthought. It created a bit of a spiral: not the best book = not the best book chat. We decided we’re too smart for such behavior, so this month we purposefully picked a book that would provoke great discussion and inspire amazing food. 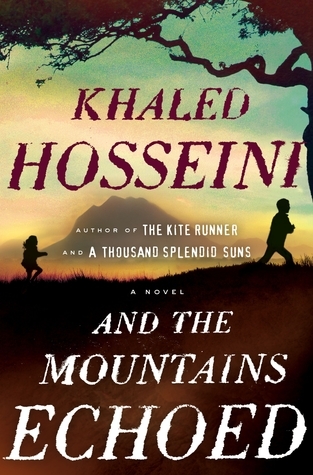 The winning selection was And the Mountains Echoed by Khaled Hosseini. I was the host for this month’s gathering. How ironic that the Chugach mountains surrounding my home started to echo just as everyone arrived. The wind howled, causing our windows to creak and the house to tremble. But we were warm and safe inside the kitchen, which bustled with conversation and smelled like cinnamon and coriander. There were barely enough burners on the stove to contain all the steaming pots, and we all took turns slicing and dicing on the cutting board. The winds whistled through the mountains and slammed into the house, but our laughter was the only thing that echoed inside. The book was good, but the food was incredible – so let’s start there. 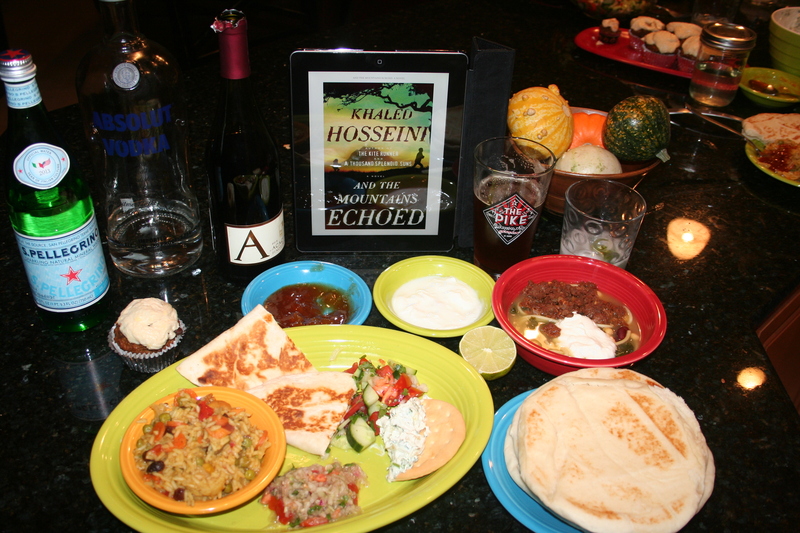 In honor of the book, we all decided to make an Afghan dish. We found an excellent Afghan food blog, which is where most of us selected our recipes. You are looking at vegetable biryani, bolani (sweet potato Afghan turnovers), two versions of salata (an Afghan salad, one rough chopped and the other in a food processor), cream cheese spread, aush (Afghan soup), naan, and little bowls of mint chutney and yogurt. Oh, and a rogue pumpkin muffin. We were all amazed at how easy these recipes were to make. Basic, simple ingredients and a few favorite spices created intensely flavorful dishes. There are some amazing cooks in our group, but on this night everyone’s food shined. Let’s just say that no one left hungry. The characters were so interconnected, even more so than we realized while reading the book. The ripple effects of their decisions were impossible to contain. We all wanted more: too many stories were started, but left unfinished. Maybe someday Hosseini will return to Adel, Gholem, Thierry, or Thalia. Or maybe he’ll leave the details of their stories to our imaginations. The discussion easily flowed out of the text and into our own lives. Would it truly be a gift to forget those we have loved but lost, or is the pain of life’s adversity essential? How could any mother abandon her child? What role do siblings play in our own lives? What stories do we share with our own children? I enjoyed this book, but it didn’t rip my heart out like Hosseini’s A Thousand Splendid Suns, which is one of my favorite titles of all time. Ever. But I do feel that And the Mountains Echoed put our book club back on track. The company is always impeccable – how could it not be with such a strong, intelligent group of opinionated women? But this time the meal and the discussion were equally rewarding, and the questions we raised last night have echoed in my mind all day.